There are times in travel when experiences seem to fall onto your lap. 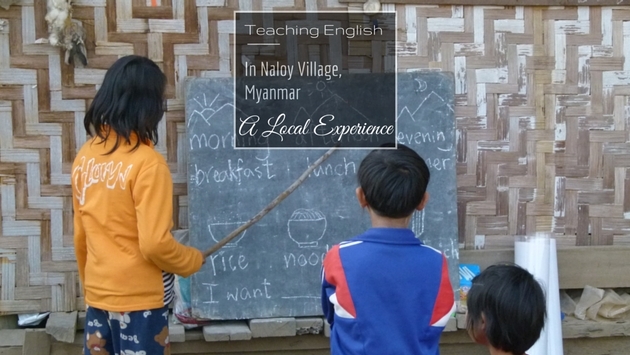 We had one such time in the small village of Naloy in Myanmar. We had made our way to the northern town of Hsipaw and expected to do some hiking and trekking into the nearby mountains, but instead we were mesmerized by the dozen or so local villages in the area and decided to stay. 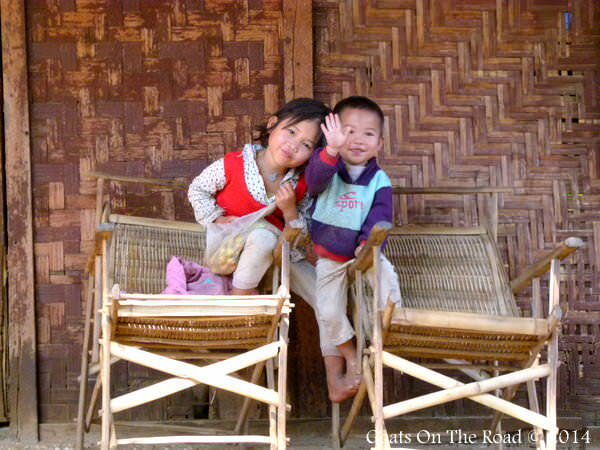 We would spend our days walking down the narrow lanes of Naloy village, which was just a few kilometers from Hsipaw. When we passed by young children they smiled, waved and greeted us "good-bye!" We chuckled at the adorable blunder and tried to teach them hello, but to no avail. We soon dubbed this friendly community, "The Village Of Goodbyes". One afternoon we were walking by a local restaurant (actually an elderly woman's home with a sign) and we decided to stop in for a smoothie. That is where we met Hope and her friends. Hope is one of the most amazing people we've ever met on our travels. She is from Taiwan, and she had been coming to Naloy village for three years in a row. She had set up a tiny school in Naloy to teach English to the village kids and she invited us to come and watch a class. She was sitting with three of her Taiwanese friends who had come to help her with her charitable project. 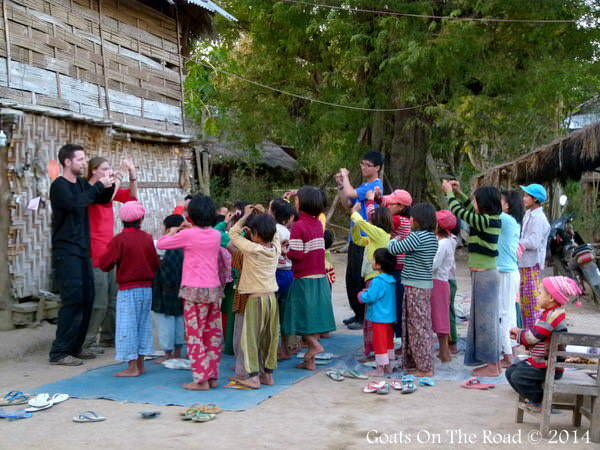 We were already interested in teaching English, and even more interested in having a local experience in a true Burmese village. This was in 2012, long before sites like WithLocals.com set up these types of local experiences for you. We had to find it for ourselves! ... and we were happy that we did. Hope took us to her tiny school in the village and that evening, we not only watched a lesson, we even had the opportunity to get up and teach in front of the 30 or so wide-eyed Burmese students. These kids had hardly seen a foreign face in their lives, aside from Hope's, who shared many of their Asian features. 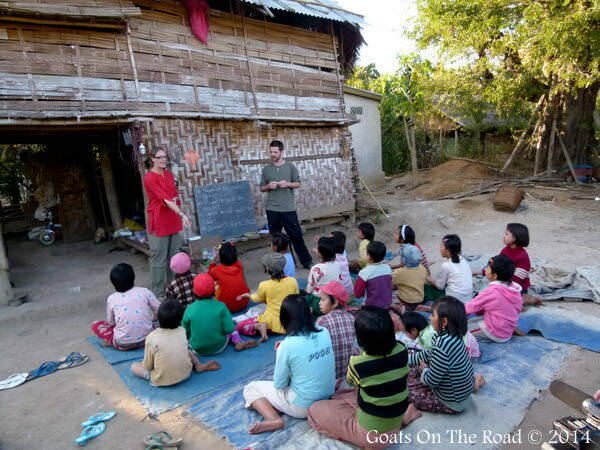 The class was set up at the village elders' home, with pigs squealing in a pen on one side, chickens clucking on the other, and a group of 30 students sitting on a tarp in the center, excitedly looking up at their teachers' unfamiliar faces. We decided to stay in Naloy for eight days to help Hope teach her classes our valuable world language. It was fun to be able to play with the adorable village children, meet their parents, and to be able to give back to the community that we were visiting. 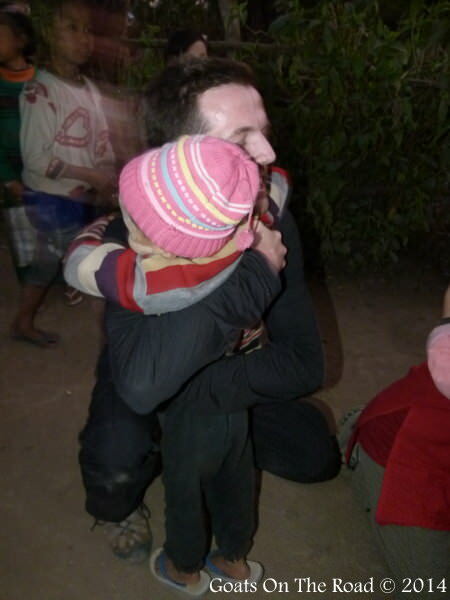 Each night after class, as the sun was going down, the children would have to make their way home, but they would never leave without giving all of the foreign teachers a big hug and a well pronounced "thank-you!" The students would then make a line and Hope would give each of them a leaf with a lit candle in it. We would then walk with them to each of their small wooden homes and bid them farewell for the evening. The sight of 30 - 40 kids, all walking in a line, with their smiling faces dimly lit by a leaf wrapped candle was beautiful. They all had something to be proud about and they were always excited to return the next night. 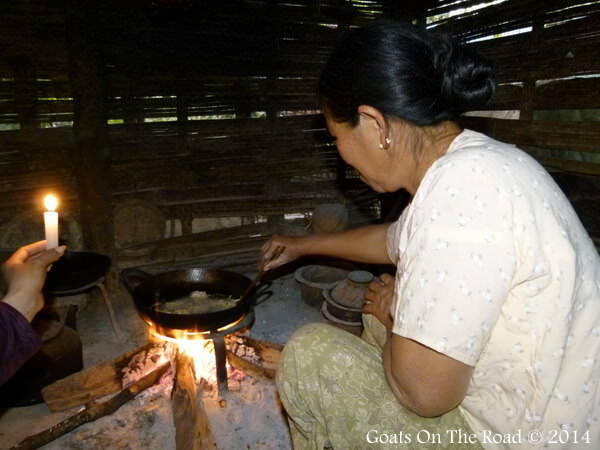 After all of the children had safely returned home, we would return to the Mama and Papa's home (the village elders) and they would prepare a delicious meal for all of the teachers. Hope, her Taiwanese friends, Dariece, myself, Mama and Papa would all sit around laughing and talking. Mama and Papa, a 75 year old couple who had never left Naloy, couldn't speak a word of English, but they expressed themselves with hand gestures and contagious smiles that warmed our hearts. The children from our little school no longer greeted tourists with a good-bye, instead they belted out a confident "Hello! How are you?!" Hope stayed for a total of 21 days and it was incredible to see the students' progress in such a short period of time. They had memorized numbers and could buy items in our makeshift market using only English. They could ask each other how they were doing and how their families were. We all felt proud of their accomplishments. Our eight days of teaching in Naloy was one of the most rewarding experiences we've ever had in travel. The smiles on those tiny faces, and the love and respect that they had for us will stay in our minds for a lifetime. When we finally bid our last farewells to Mama, Papa and our loving students, there were tears and obvious hopes for our return. We said our good-byes and to this day, we look back on Naloy with nothing but fond memories. Our experience there led us to begin a career teaching English in China, and we hope to one day return to our tiny village of goodbyes. Nick and Dariece are the couple behind Goats On The Road, a website designed to inspire others to live a financially sustainable, location independent lifestyle. Masters at making money abroad and turning their travels into a way of life, they've been on the road since 2008 and have explored some of the least visited places on earth, finding adventure wherever they go. They are also full time contributors at Credit Walk where they share their expertise of making money and travelling forever. Check them out at Goats On The Road.com. and follow them on Twitter, Facebook and Google+.